Recently, I’ve got a little bit addicted to making soap. I made a few presents for friends and family with the girls. 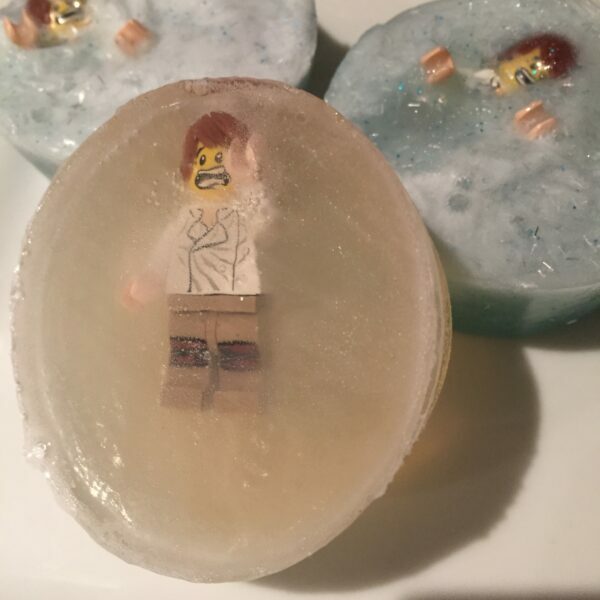 They particularly liked making Han Solo soap as it looks like he is frozen in carbonite. It makes a great gift for a Star Wars fan. To make these we ordered some Han Solo lego pieces from eBay. We changed the heads so it looked like he was upset. The actual process of making the soap is really easy. Simply put the figures into the silicone molds. Then cut the soap base into pieces and heat it slowly iuntil it melts. You can add a little glitter and some scent. Then pour over the top of the figure and leave to set. After a short time, the soap will have set and the mini figure looks like he is frozen in carbonite. We tried a set with a little bit of blue colouring but it actually looked better just using the clear base. To finish the soap, we wrapped in clear cellophane and tied a ribbon around it. We found it was a really good way to encourage the children to wash their hands as they couldn’t wait to get to the fiure trapped inside. Clearly the force is strong with those ones.